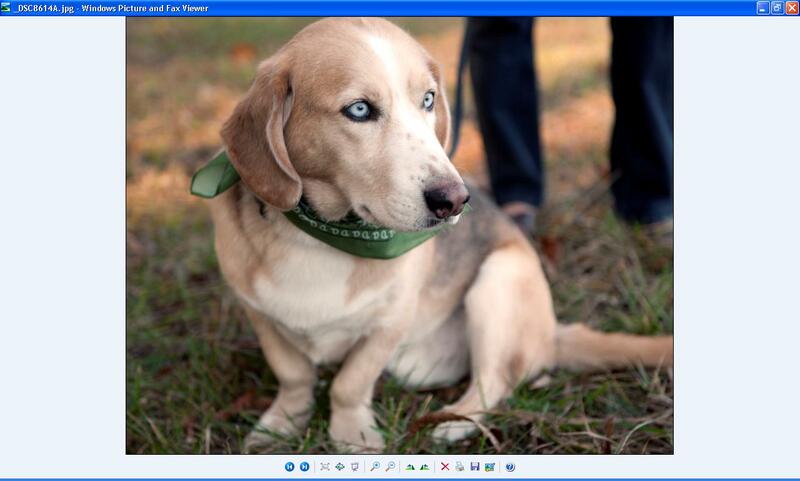 As some of you know from some previous posts, I have long wished that the over 50 people who have searched for variations on the term “husky-basset hound mix” would let me know why they are looking for the information; I have always thought that Mandy is probably the most unusual dog I will ever come across, both in looks and in personality. 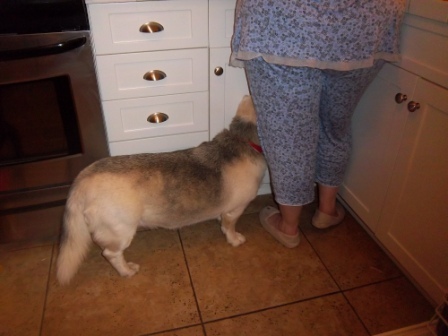 Well, two days ago, I got an e-mail from a woman named Needa in Nashville, who has a dog named Sawyer who is – wait for it – also a husky-basset hound mix. Pictures were immediately exchanged, and the two do look very much alike, especially when they both have been recently groomed. Sawyer has a little bit more of the red/brown coloring of a basset hound, while Mandy has picked up more of the silver/white/gray of the husky, but still, the resemblance is amazing. You can see how much alike they look in the two pictures above. Sawyer’s most obvious difference from Mandy is that he is a male and she a female, but there are other differences. I think Mandy is a little more solid than Sawyer, although I haven’t yet met Sawyer to have him jump on me with all of his weight concentrated in his front two paws. 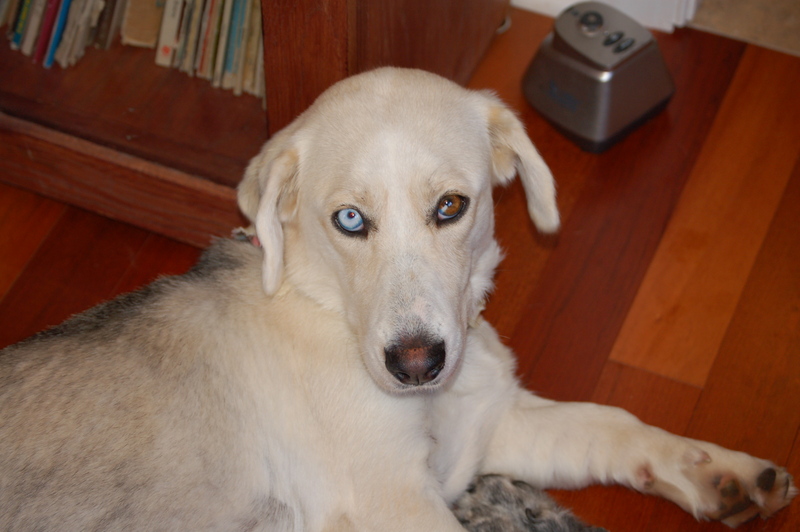 Sawyer has two blue eyes, instead of Mandy’s one brown eye with a hint of blue in it and her other completely blue eye. There are a lot of similarities, too. Sawyer has a “pageant pose” similar to Mandy’s, although Needa and her husband call it the “noble pose,” which makes sense since Sawyer is a boy. Sawyer likes to chew – Needa says the first day she had him he demolished her digital camera, which made me grateful for Mandy’s preference for light cords – and does so on about the same four-hour schedule that Mandy holds. Mandy and Sawyer can be trusted alone in the house for about four hours, then they get anxious about their owners being gone and start demolishing something. At least they have a good reason; Darwin chews sometimes just for the pure joy of it. 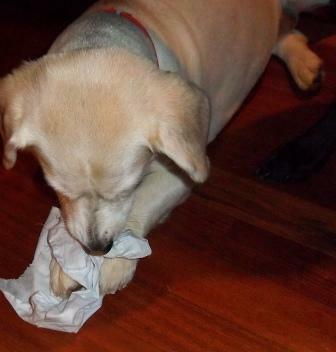 To be honest, Mandy chews handkerchiefs for the pure joy of it also, but the more destructive chewing comes after four hours! 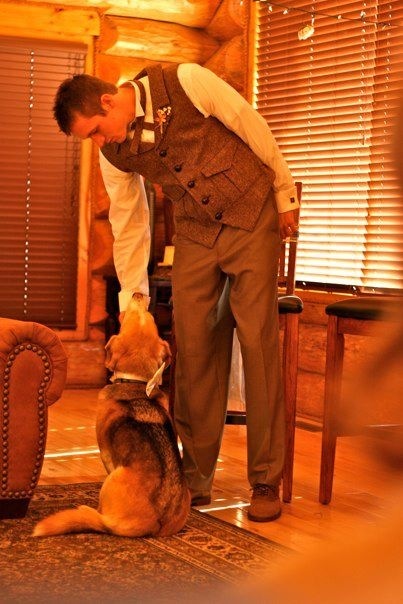 Sawyer does not have to be bossed around by a child of any age, let alone a ten-year old girl – Needa and her husband just got married three weeks ago! Congratulations to them. 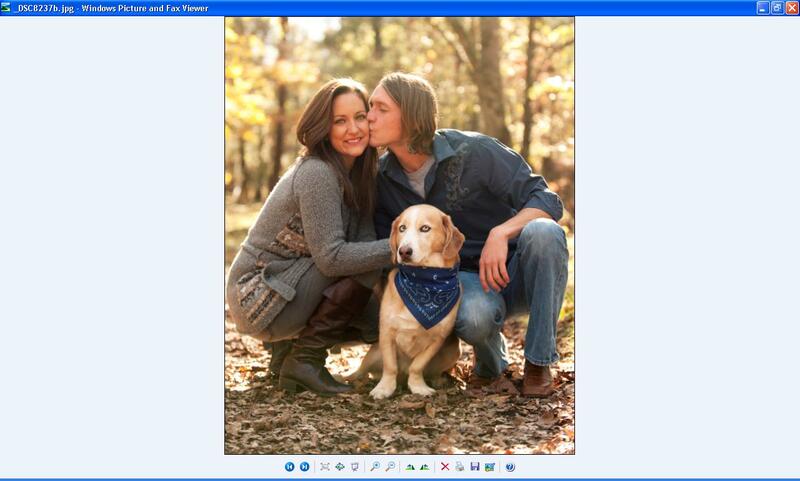 Here is an engagement photo they took with Sawyer in it. 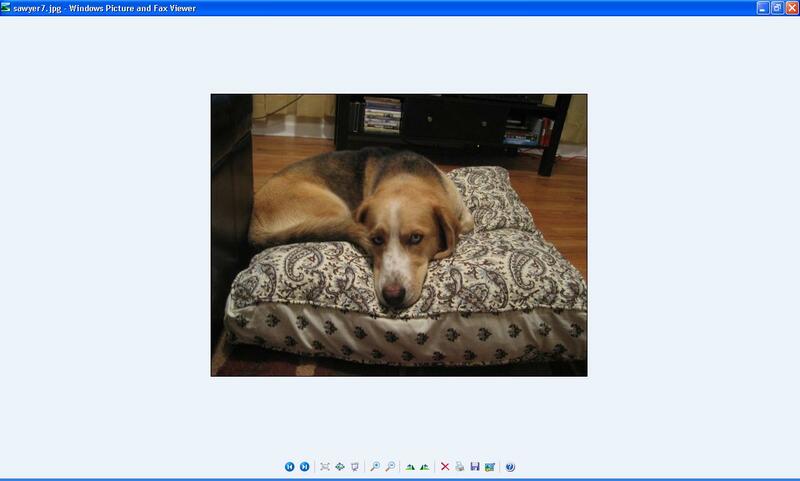 Sawyer was adopted in Huntsville, Alabama at The Ark; someone found him wandering around the roadside there. Mandy is also an Alabama dog; as you know from a previous post, she was adopted at the Montgomery, Alabama humane shelter, where she had been taken after she had been found digging in the dumpster for McDonald’s. They both are very independent; I am not sure if that is the basset hound temperament coming out, or if part of that comes from surviving “on the street” for a period of time. They both are very loving dogs, too; they just have very high self-esteem. One day, we hope maybe to get the two of them together, but that won’t happen for a while. Either way though, welcome to Sawyer as a potential cousin, if not brother of our own Mandy, and thank you to the many friends and relations of Needa who have stopped by this blog in the past two days to look at pictures of Mandy. I hope you’ve enjoyed your visits! 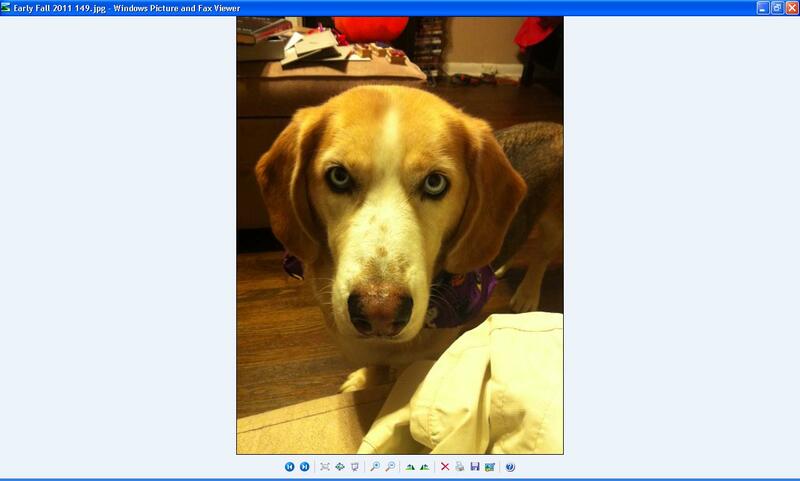 If anyone out there stumbles by this blog and has a husky-basset hound mix, please let me know. I’d love to hear about him or her! 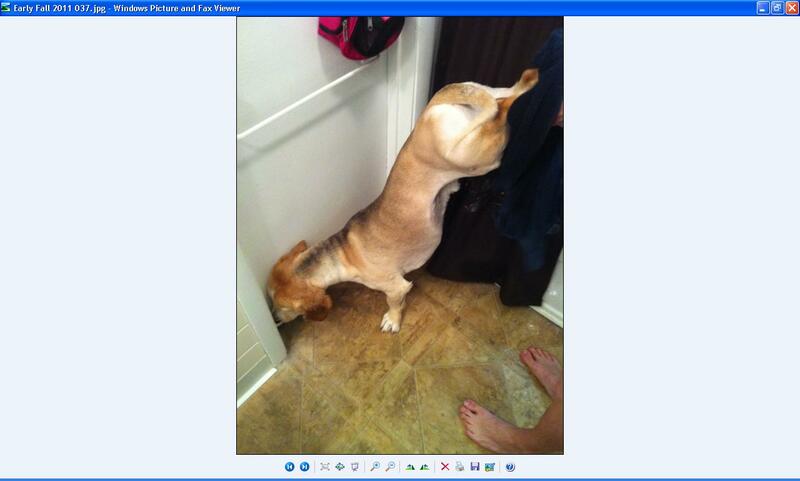 This entry was posted in dogs, working mom and tagged dog photographs, dogs, family, husky basset hound, Mandy, pets, Sawyer. Bookmark the permalink. Wow, that is an amazing discovery. 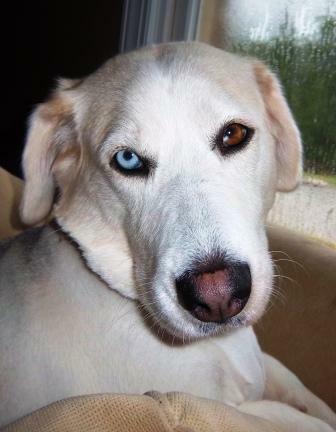 As you say, a “husky-basset hound mix” does sound unique but they might be from the same litter. I like to think they were from the same litter, whether they were or not.